Home > Tips > Instagram for PC: Can I Use Instagram on PC? Instagram for PC: Can I Use Instagram on PC? Smartphones are an important and irreplaceable part of our lives these days. From drafting word documents to taking photos, they help us perform a myriad number of tasks in our day to day routines. On top of all the functionalities of a pocket PC that they provide, at their core, they are still a communication device. And there are numerous apps available in the app store that provide multiple ways of communication between people. One of these popular apps is the Instagram app. Its is one of the best, and most popular apps available on smartphones these days – both on Android and iOS. It enables its users to share images, that they click, with their friends and family. These can be of a place, an object or simply of themselves. The popularity of Instagram can be gauged from the fact that Facebook bought this app, spending millions of dollars on the deal. Instagram boasts on millions of monthly active users, which is quite a marvellous feat in itself. Though Instagram offers very user friendly and powerful mobile apps to its users, it lacks a dedicated desktop/laptop app. Many people, who use pc, often ask this question – Is there an app available for Instagram on PC? 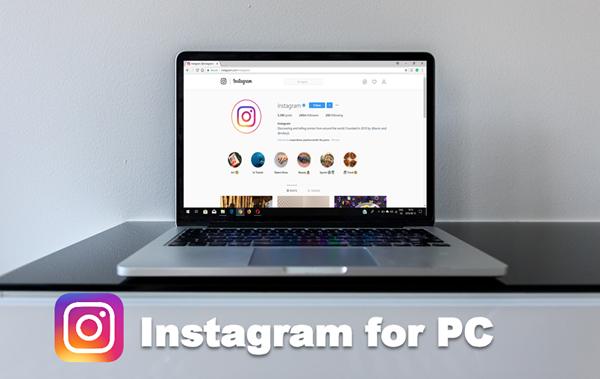 If you are looking for a way to use Instagram on your PC, then this guide will help you achieve just that. Just follow along. 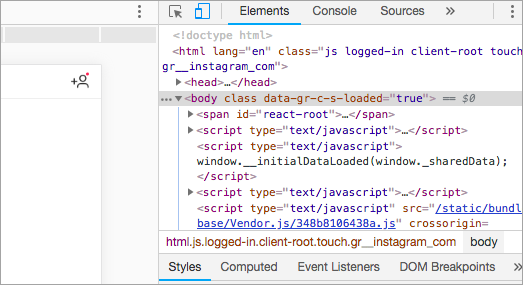 You can also use this chrome extension to browser Instagram on your desktop, just like would on your mobile apps. You can access this extension from the link above. 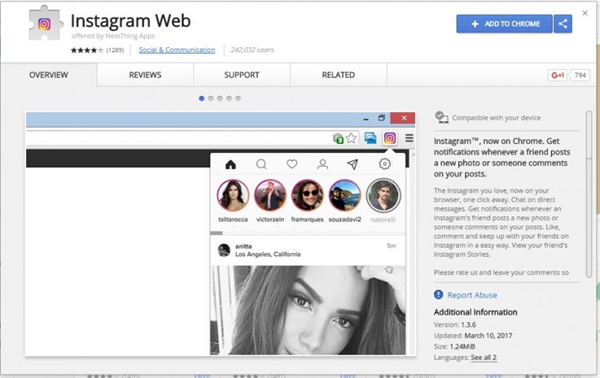 Just install this extension to your chrome web browser and access instagram.com like normal. The extension will do its magic in the background and show you the mobile app view of Instagram. You will see the stories of your friends at the top and the bottom tabs with the add photo button. This extension also allows you to download Instagram photos directly to your desktop, something which is possible neither on instagram.com, nor the Instagram mobile apps. So that’s a bonus feature to have as well. However this extension works only with chrome so if you hate chrome, you are pretty much stuck. I am sure many of you know that Instagram has a website which can be used to access it. However, this website is pretty barebones and can only be used to view our Instagram feed and view our profile. It is not possible to upload a new photo to Instagram from this website. However, there is a trick which can be used to achieve this on the website as well. So if you don’t trust the extension mentioned above, then you can literally do the same magic yourself to access the mobile app view of Instagram. If you are using Chrome browser on either Windows and Mac, then this will work very well. Other browsers may be able to replicate this too. Just follow the steps mentioned below. Open Instagram.com on your chrome browser and log in like normal. You will be greeted with the desktop version of the website. Right click anywhere on the screen and select the option that says Inspect. A side window will open that will have many options. At the top, on the left of the label Elements, there is an icon that allows you to change the device type for which the website is being displayed. When you click this icon, the browser automatically switches the device view to mobile. You can click the dropdown to select any option. I would suggest to select iPad as the option. You will see the website changes itself to the mobile view, but it’s still just a basic website. At this point reload the tab again by pressing Ctrl+R. When the website reloads, it will open the mobile app version of the website and you will see the bottom bar which has the tabs just like those in a regular mobile app. Now you can close the sidebar and use the app as normal. This also brings the stories bar at the top, just like on a mobile app, and you can view all stories posted by your friends. This is also something not easily achievable on the desktop website of Instagram. If you are a Safari user on a Mac, you can do something similar on that browser as well. However, for that you need to enable a setting on your Safari browser. Follow the below guide completely to access complete Instagram on Safari. First, we need to open Safari browser on your Mac. Then you need to click on Safari menu at the top left and select Preferences option. From the popup menu that opens, select the Advanced tab, which is the last tab. 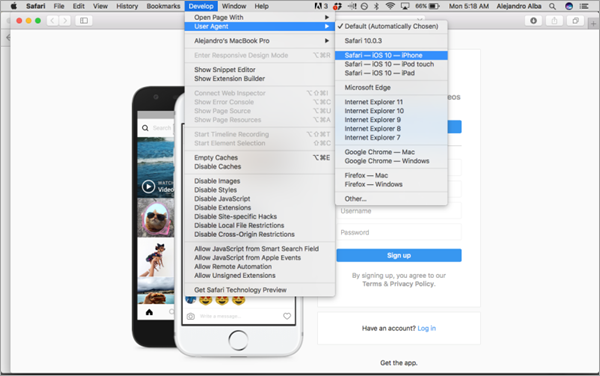 On the Advanced tab, select the checkbox to enable Develop menu option on Safari menu bar. Now, open Instagram. com on your Safari browser and login as usual. Now click on the Develop menu at the top, that you enabled above, and select the User Agent option. This will open a side menu. Select Safari for iOS as the user-agent. Your website should turn into a mobile app version and you should see a layout just like you see on your Instagram mobile app. If you don’t just reload the page and that should do it. If you use Firefox, then also you can access Instagram on desktop. However, for that you need to change the user agent of you browser. The default process of this is very complex. So you can install a Firefox addon. This will add a button to your browser which will allow you to change the user agent of the browser. Choose the mobile agent and reload the page to access full Instagram on your Firefox browser. Then all is done! So, as mentioned above, these are a few ways using which you can access and use Instagram on your desktop browser. There may be some proper desktop application available as well, but most are paid and offer similar functionality. Using our guide, you can access complete Instagram on desktop from free. We hope you find this article useful! How to Know Who Had Viewed My WhatsApp Profile Today?